Fight fans were given a night to remember on Saturday 4 October when Suggy’s Gym and NMA Fitness Centre swept the board in a show featuring up and coming juniors alongside established adults, showcasing their skills both in K-1 kickboxing and in Mixed Martial Arts which with UFC is the fastest growing sport of the last decade. The show at the Magnus Sports Centre marked the launch of the new brand and format, Superstar Fight League, incorporating Rookies Rumble IV, and an ecstatic home crowd raised the roof as local fighters claimed successive victories in Newark’s first ever event held in a cage octagon. The scene was set from the start with a big win for eight year-old Sam Hardy against Essex-based Billy Shelton, quickly followed by another NMA win when Andrew Price (12) defeated Kent’s Connor George under kickboxing rules. With K-1 Global star Chad ‘2 Slick’ Sugden in the Newark corner, the local youngsters were determined to shine as the action continued with back to back victories for 10 year-old Alfie Price and Jordan Haywood, making his debut for NMA just days before his 11th birthday. In the main event on the Rookies Rumble fight card, Megan Williams faced a tough contest against Peun Tann’s Danielle Butler. With both weight and age against her, Megan started well but after a close first round was left with everything to fight for in rounds two and three. Drawing on all her reserves of grit, determination and resilience, the 13 year-old from Newark rose to the challenge, using her superb boxing skills to take the fight and with it the title of new ISKA English K-1 Champion. There was more K-1 excitement to follow, as the Suggy’s Gym seniors took to the cage. Well known for their fitness, strength and attention to detail, they all began to push the pace and three close-fought contests saw more wins for Jack Simmons, Bailey Sugden and Lewis Fallon. Then it was time to switch to Mixed Martial Arts, with Suggy’s Gym wrestling coach Krzysiek Adamczyk in the cage against Team Siam’s Ross Gallagher. Three gruelling three-minute rounds followed, as the local fighter took on an opponent with a record of seven wins and only one loss. But after a close-fought contest, to the delight of the crowd and the corner the honours went to yet another Newark fighter. 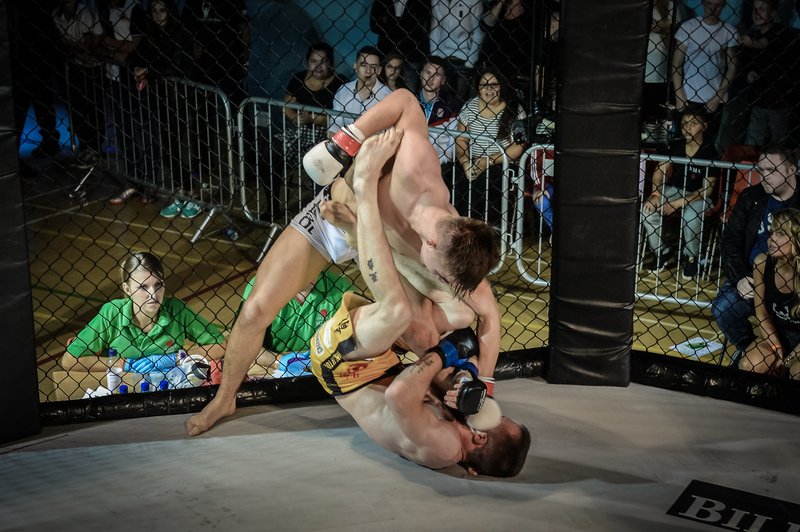 Following the only match up of the night not featuring Suggy’s Gym or NMA, one of Newark’s favourite sporting heroes brought the evening to a close with more MMA action in the main event on the Superstar Fight League card. In a last minute change of opponent, Regis ‘The First’ Sugden took on Anthony Buttle from Leeds, demonstrating all aspects of this fast growing sport as he took control with his striking and nullified Anthony’s take downs with take downs of his own. Although both fighters scored equal take downs, Regis was always on top whether on the ground or on his feet, dominating the striking and scoring an emphatic win against a strong wrestler and Jitsu fighter. Summing up the night, head coach and owner of Suggy’s Gym Dean Sugden added: “For the past 14 years, fighters from Suggy’s Gym and Newark Martial Arts have done themselves, the gym and their home town proud and tonight was no exception. “On our shows we always put the fighters first, whether they are up and coming prospects or seasoned professionals, which is why they all love to take part in our events and why we have access to the very best. “Over the years we’ve seen many of the contenders who started on our promotions go on to become some of the leading fighters not only in the country, but also in the world.